Accomplished amateur golfer Charles Bryan Houghton, affectionately known as Bryan, is reputed to have scored the first hole-in-one on the Alliss/Thomas designed Brabazon course at the Belfry after its opening in 1977. He has now celebrated another memorable milestone in his illustrious career – not in golf on this occasion, but in Freemasonry. Harry Cox (left) presenting the commemorative certificate to Bryan Houghton. 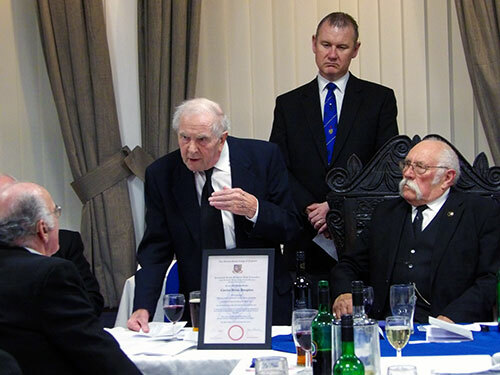 In front of a gathering of largely master Masons in Bryan’s mother lodge of Great Marton Lodge No 3985, Assistant Provincial Grand Master Harry Cox officiated over the celebration of Bryan’s 60 years in Freemasonry. As might be expected on such a special occasion, there was a plethora of distinguished Masons on hand to share the celebrations. 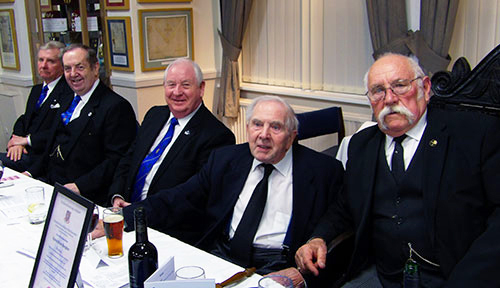 Joining Harry were grand officers Stuart Thornber, Mike Goodwin, Geoffrey Pritchard, Peter Bentham and Chairman of Blackpool Group John Turpin, along with acting Provincial grand officers Ian Halsall, Philip Houldsworth and Jim Finnegan. No sooner had master of the lodge William Barrow efficiently and confidently opened the lodge and dispensed with the general business, than the procession of dignitaries entered and the gavel of the lodge was transferred to Harry Cox who, as he always does on such occasions, provided an entertaining and informative résumé of Bryan’s life and Masonic career. During the presentation it came to light that Bryan had enjoyed an eminent career in golf. In his younger years he had been a ‘scratch’ golfer, captain of Fairhaven Golf Club in 1978, a past captain of the Captains of the Fylde Society of Golf Clubs and was President of the Lancashire Union of Golf Clubs in 1987. But his sporting talents were not restricted to golf. During his school days at Baines Grammar School, Poulton-le-Fylde, he played in the school’s first teams at both football and cricket, although his footballing career came to an abrupt end when he collided with an opposing goalkeeper and damaged his leg, just above the ankle. Despite being assured that it was not a serious injury, Bryan was taken to Victoria Hospital for a routine check. As a result of the routine check, Bryan was kept in hospital for over a week – with a badly broken leg! Later on in his sporting career, Bryan ventured into the realms of water polo. As a member of the Blackpool Swimming Club and its water polo team, he competed in the semi-finals of the English Water Polo Championships. Those familiar with the sport will be aware that it is not for the faint-hearted. Not only is it physically demanding, tough and highly competitive, it requires a great deal of skill. Master of Great Marton Lodge William Barrow proposing the toast to Bryan during the festive banquet. Despite his many achievements, Bryan remains an extremely modest and unassuming individual with a delightful and impish sense of humour that immediately endears him to those privileged to have met him. Born 6 November 1933 in Marton, Bryan is the son of Henry and Doris Houghton. His father was a dairyman and his mum was a full-time mother and housewife. Apart from his natural flair for sport, Bryan’s early interest was in engineering and excelled in physics, mathematics and chemistry at school. Little surprise then that on leaving school Bryan started work as a student apprentice at English Electric, attending Harris College on day release. English Electric has, over the years, experienced a variety of name changes, becoming the British Aircraft Corporation, British Aerospace and, in its current format as BAE Systems. Bryan qualified as an aeronautical engineer and was initially selected for the design office but requested that he work in the service department, preferring a hands-on practical route. When called on to serve his National Service, he was enlisted in the RAF and was stationed at Cardington before being transferred to RAF Thorney Island near Portsmouth. During WWII, Thorney Island was used as a mosquito breeding ground to conduct research into malaria and, unfortunately for Bryan, the mosquitos were still in abundance during his stay at the camp – not the most comfortable of environments! Thankfully, he was later transferred to RAF Syerston and then Beaconsfield, where his sporting prowess was recognised and he was granted one day off per week to pursue his swimming and water polo, playing for Newark Swimming Club. Good news for Bryan one would think but one week from completing his National Service he was selected to represent the training command at RAF Cosford, meaning that his National Service was extended a week longer than it should have been. His natural aptitude for sport was such that, despite his somewhat diminutive size, he played in the camp basketball team. Even rugby was not outside the bounds of his abilities, playing in the interstation competition as wing three quarter – regardless of the fact that he had never played rugby in his life. Needless to say, it was his first and last game. On completing his National Service, Bryan returned to work at English Electric where he progressed through the drawing office, the stress office in which he assessed the stresses and strains on aircraft, and onto the technical management department, eventually retiring in 1992 after 42 happy years’ service. Bryan’s impish sense of humour was to the forefront during his response. Bryan married his wife Cynthia in 1960 and they have a son David and four grandchildren; three boys and a girl. David is a prominent consultant in Glasgow and all four grandchildren are excelling in their academic careers. Their grandson Patrick has a first class honours degree in international business, their granddaughter Georgina has a first class honours degree in physics, and their two remaining grandsons are following their siblings’ footsteps. Joe is at St Andrews studying physics and Edward is going to Edinburgh University to study IT. Academic excellence in his son and grandchildren is not surprising as Bryan’s wife Cynthia was a teacher, originally at St George’s School, Blackpool. She always had an affinity to teach children with special needs however and moved to Singleton Hall teaching physically handicapped children, later moving to Great Arley School in Thornton and finally to Garth House in Preston as headmistress. Turning to Bryan’s Masonic career, Harry informed the gathering that Bryan had been proposed into Freemasonry by his father Henry, better known as Harry, and was initiated into Great Marton Lodge on 17 March 1958 in the lower lodge room at the Masonic Hall, Adelaide Street, Blackpool. It was at this juncture in the presentation that Harry requested that the secretary of the lodge Rodney Holt read the relevant paragraphs from the minutes of that meeting. Henry (Harry) Houghton had been installed as master of the lodge at the previous meeting and conducted the initiation ceremony and gave the address. Bryan was passed on 21 April 1958 and raised on 21 October of that year, again his father conducting the ceremonies as master of the lodge. It was an era when progression to the chair was not as rapid as it now is and Bryan, although initiated in 1958, did not get appointed as steward in the lodge until 1963 and inner guard in 1970, eventually working his way through the offices until finally becoming master in 1975. As master, he initiated, passed and raised Jack Monks, the current vice president of the Blackpool Masonic Club. 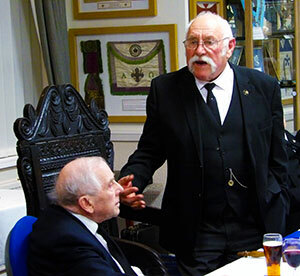 On relinquishing the chair, he continued to conduct ceremonies, including the raising of lodge director of ceremonies Paul Hunter, and has presented the traditional history on numerous occasions and similarly, the presentation of Grand Lodge certificates. He has served as charity steward, assistant director of ceremonies and director of ceremonies, receiving his first Provincial appointment as Past Provincial Junior Grand Deacon in 1987 and promotion to the very high rank of Past Provincial Junior Grand Warden in 1995. Bryan was exalted into the Royal Arch in 1984 in Blackpool Chapter of Fellowship No 7692 and installed as first principal in 1990, thereafter being honoured by Provincial grand chapter with the rank of Past Provincial Grand Sword Bearer. He is also a high-ranking member of another Masonic Order. Pictured from left to right, are: Stuart Thornber, John Turpin, Harry Cox, Bryan Houghton and William Barrow. As Harry Cox so eloquently stated: “Over the past 60 years, Bryan has proved himself a man of consummate integrity and commitment” and considered it a tremendous privilege to have researched and presented a brief history of his life. 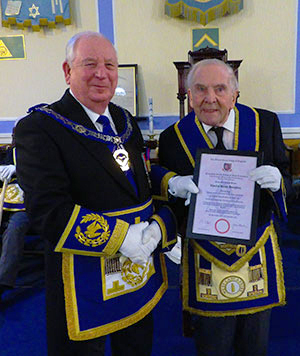 To celebrate the occasion, Harry invited Blackpool Group Chairman John Turpin to read a commemorative certificate from the Provincial Grand Master Tony Harrison, prior to Harry presenting it to Bryan. Understandably, Bryan was very moved by the presentation but with his usual humility he accepted it with typical Anglo-Saxon reserve. Bryan is a perfect gentleman and unpretentious at all times. Whilst exuberant in his thanks to Harry for the marvellous presentation, Bryan’s upper lip remained absolutely firm. Such is the delight of this mild mannered and humble Mason. Although the formal part of the celebration was concluded, the festivities continued with Blackpool Group Vice Chairman David Cook presenting Bryan with a commemorative lapel badge that Bryan will sport with pride. It was therefore with a special cheeriness that the throng sojourned to the festive banquet to continue the revelries. The air was filled with merriment and joy. Desultory conversation was proceeding in the liveliest manner and laughter provided ample evidence of fun and jollity. And it was in such spirit that Bryan responded to the toast to his health by master of the lodge William Barrow. Bryan, on his part, entertained his audience with the impish humour that he is so well known for while he reminisced over his 60 years in Freemasonry. One could not have wished for a better closing to a wonderful celebration. No matter how many hole-in-ones Bryan may have scored during his golfing career, his celebration of 60 years in Freemasonry was absolutely on target. Pictured from left to right, are: Ian Halsall, Mike Goodwin, Geoffrey Pritchard, Stuart Thornber, Harry Cox, Bryan Houghton, William Barrow, John Turpin, Philip Houldsworth and Jim Finnegan.